Climbing plants are essential for adding color and visual interest to fences, walls, trellises and even old posts or tree trunks. Common plants, such as morning glories and climbing roses are popular choices. These plants require full sun, which may not suit every landscape. Climbing plants that tolerate full to partial shade allow gardeners to utilize landscaping structures in areas that do not get full sun. Clematis is an ornamental deciduous vine that prefers dappled shade. These perennial vines adapt to a number of soil conditions and bloom during the early spring moths, generally May through June. According to Clemson University Extension clematis prefer to grow with their “their heads in the sun and their feet in the shade." 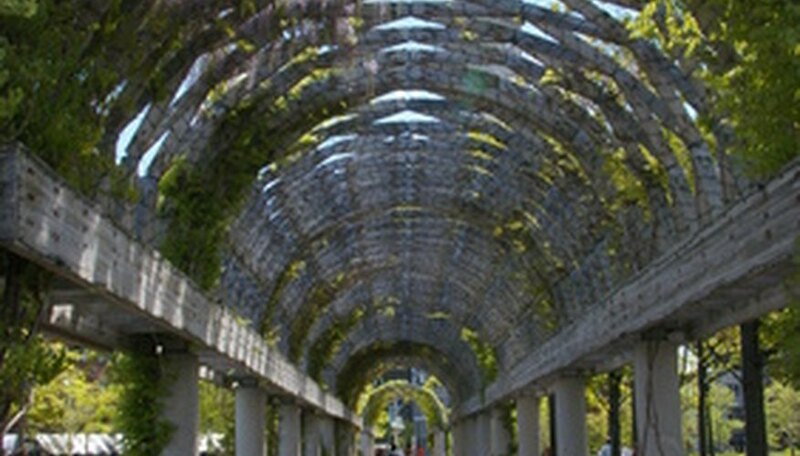 This means that although this vine likes shade they do need at least 6 hours of indirect sunlight to produce blooms. The plants roots need cool moist conditions to support the overall health of the plant. Clematis comes in various colors including red, purple, white, violet, pink and variegated or bi-colored varieties. In addition to their showy blooms, these climbers have strong fragrances that range from almond or vanilla to a rich coco scent. 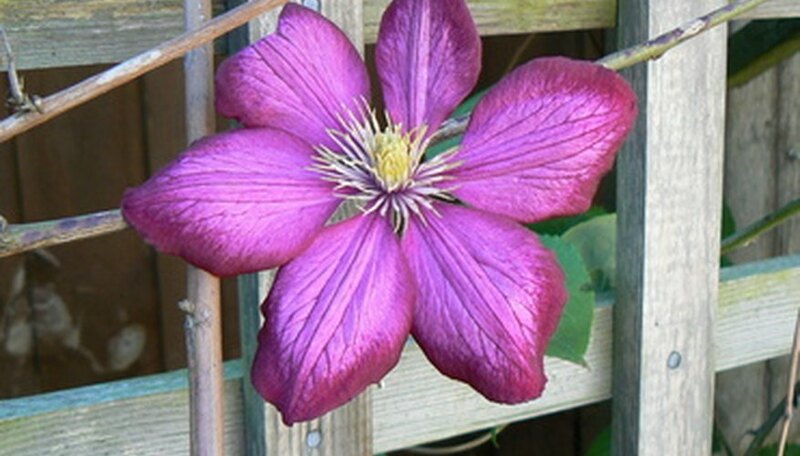 Clematis is notoriously used for trellises, fences and walls. English ivy will flourish in deep shade. Although this plant does not produce showy blooms it does add deep green foliage and will grow in almost any landscape site. 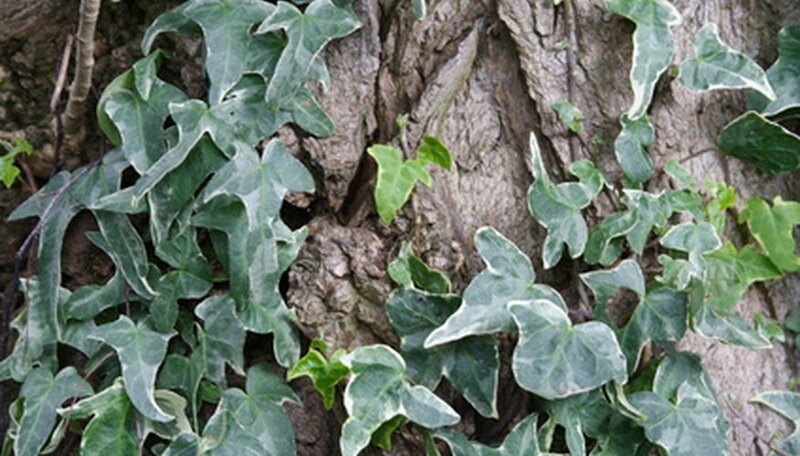 Texas Agrilife Extension Service states that English ivy can be used as a ground cover as well as a climber that will spread over a large area in a short period of time, once established. This type of shade plant can be used on trellises, fences, walls and window boxes and comes in a variety of leaf shapes. In addition, this plant will grow over almost any landscape eyesore, making it a great way to cover old tree stumps. Climbing hydrangea is another example of an ornamental climber that can tolerate shade. This plant features clusters of small white flowers that bloom June through July and produce a sweet fragrance. And although climbing hydrangeas do tolerate partial shade they will need some dappled sunlight to bloom. As with clematis, the climbing hydrangeas benefit from indirect sun that mainly highlights the vine itself, allowing the roots to remain cool and shaded. In addition, these climbers like moist but well drained soil. According to the University of Illinois Extension, climbing hydrangeas are slow to start but growth rate increases as the plant ages.